Thorogummite: Mineral information, data and localities. Named for its thorium content and Latin "gummi", gum, alluding to its gum-like appearance. Discredited as a valid species in 2014 (IMA14-B). This name has been used to describe heterogeneous mixtures of secondary, non-crystalline minerals, produced by the alteration, hydration, or metamictization of thorite. Thorite 8 photos of Thorogummite associated with Thorite on mindat.org. Diopside 3 photos of Thorogummite associated with Diopside on mindat.org. Cyrtolite 3 photos of Thorogummite associated with Cyrtolite on mindat.org. Kasolite 3 photos of Thorogummite associated with Kasolite on mindat.org. 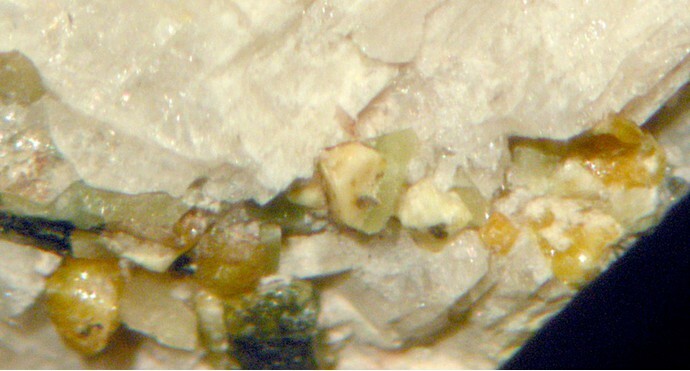 Xenotime-(Y) 3 photos of Thorogummite associated with Xenotime-(Y) on mindat.org. Behoite 2 photos of Thorogummite associated with Behoite on mindat.org. Microcline 2 photos of Thorogummite associated with Microcline on mindat.org. Wölsendorfite 2 photos of Thorogummite associated with Wölsendorfite on mindat.org. Thorian Uraninite 2 photos of Thorogummite associated with Thorian Uraninite on mindat.org. Zircon 2 photos of Thorogummite associated with Zircon on mindat.org. Contains thorium and uranium - always wash hands after handling. Avoid inhaling dust when handling or breaking. Never lick or ingest. Avoid prolonged exposure in proximity of the body. Store away from inhabited areas. American Journal of Science (1889): 138: 480. American Mineralogist (1953): 38: 1007-1018. Canadian Mineralogist (1989): 27: 643. O. Haluska (1975). El Torio en la Naturaleza. Yacimientos de Torio en Argentina. Programa Prioritario de Plantas Químicas. Comisión Nacional de Energía Atómica. Buenos Aires, Argentina. O. Haluska ((1975). El Torio en la naturaleza. Yacimientos de Torio en Argentina. Programa prioritario de Plantas Químicas. Comisión Nacional de Energía Atómica. Buenos Aires, Argentina. Victorio Angellelli (1958). Los minerales de uranio sus yacimientos y prospección. Departamento de Geología y Minería. Comisión Nacional de Energía Atómica. Argentina. O. Haluska (1975). El Torio en la naturaleza. Yacimientos de Torio en la Argentina. Programa Prioritario de Plantas Químicas. Comisión Nacional de Energía Atómica. Buenos Aires, Argentina. Mercer, C.R., 1961. Results of diamond drilling at Saunders Creek, near Halls Creek, Western Australia. Record 1961/039. Bureau of Mineral Resources, Geology and Geophysics, Canberra. Hogarth, D. et al., 1983, Classic Mineral Collecting Localities in Ontario and Quebec:, p. 29. GOLIÁŠ, V. (2002): Thoriová mineralizace Českého Masívu. – MS, dokt. práce, PřF UK Praha. Filip, J., Houzar, S., Sulovský, P.: Allanit a produkty jeho přeměny z pegmatitu a ze skarnu u Rešic, západní Morava. Acta Musei Moraviae, Scientiae geologicae, 2002, roč. 87, s. 87 - 101. Abd El-Naby, H.H. (2009): Ore Geology Reviews 35, 436-446. Cuchet, S., Crumbach, M. and van der Burgt, A. (2014): Das Binntal enthüllt ein grosses Geheimnis. Schweizer Strahler 48 (2), 2-55 (in German and French). Orlandi P., Franzini M., 1994. I minerali del marmo di Carrara. Amilcare Pizzi S.p.A., Milano. Matsubara, S., Miyawaki, R., Yokoyama, K., Momma, K., Shigeoka, M., and Hashimoto, E. (2013) Pyrochlore and microlite in a pegmatite at Atagoyama, Koriyama City, Fukushima Prefecture, Japan. Bulletin of the National Museum of Nature and Science, Ser. C, 39, 1–6. Sueno, S., Matsuura, S., Bunno, M., & Kurosawa, M. (2002). Occurrence and crystal chemical features of protoferro-anthophyllite and protomangano-ferro-anthophyllite from Cheyenne Canyon and Cheyenne Mountain, USA and Hirukawa-mura, Suisho-yama, and Yokone-yama, Japan. Journal of mineralogical and petrological sciences, 97(4), 127-136.
ex-Okamoto collection, now (2015) on display at Hakusekikan museum, Hirukawa. Besairie, H. (1966): Les Gites Minéraux de Madagascar. Annales Géologiques de Madagascar, Tananarive, 34. Besairie, H. (1966): Les Gites Minéraux de Madagascar. Annales Géologiques de Madagascar, Tananarive, 34, p. 398.
ⓘ Muiâne pegmatite (Emdal Mines) ? 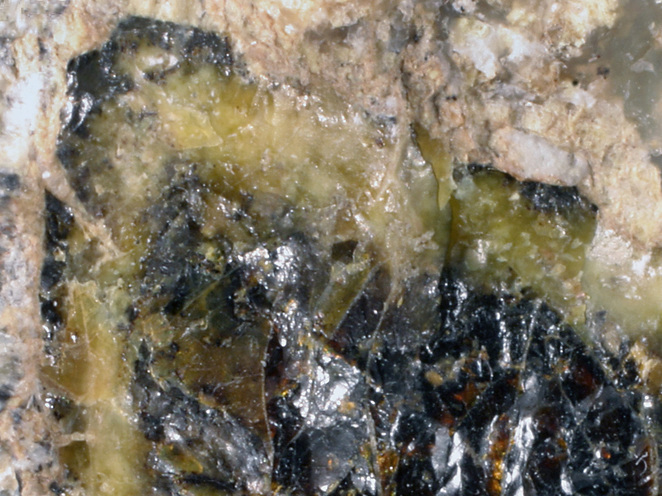 Dias, M. Bettencourt and Wilson, W. E., 2000, Mineralogical Record, 31:459-497. Irene M. Abraham (2009): Geology and spatial distribution of uranium mineralisation in the SK anomaly area, Rossing area, Namibia, Master thesis University of the Witwatersrand. Åmli, R. (1969): Secondary uranium and thorium minerals from Einerkilen granite pegmatite in Evje, Southern Norway. Norges Geologiske Undersøkelse 258 [Årbok 1968]: 124-130 + Neumann (1985, p. 140). ⓘ Landsverk 1 Feldspar Quarry (Jokeli) ? Info. board at the mine, 2005.
ⓘ Gryting Feldspar Quarry ? ; Mochnacka, K., Oberc-Dziedzic, T., Mayer, W., & Pieczka, A. (2015). Ore mineralization related to geological evolution of the Karkonosze–Izera Massif (the Sudetes, Poland)—Towards a model. Ore Geology Reviews, 64, 215-238. Paulina Hîrtopanu, Robert J. Fairhurst, Gyula Jakab, Sorin Silviu Udubaşa (2017): Monazite-(Ce) and its associations from the Ditrau alkaline intrusive massif, East Carpathians, Romania. Romanian Journal of Mineral Deposits 90, 27-40. Mironov A.G. and Gofman A.F, (1979) Barian betafite in pegmatites of Transbaikalien, - Minerals and Minerals Paragenesisa of Rocks and Ores, Leningrad, Nauka, p.127-132 (in Russian). Kilias, S.P., Pozo, M., Bustillo, M., Stamatakis, M.G., and Calvo, J.P. (2006): Mineralium Deposita 41, 713-733. Stalder, H. A., Wagner, A., Graeser, S. and Stuker, P. (1998): "Mineralienlexikon der Schweiz", Wepf (Basel), p. 402. Cuchet, S., Schnyder, C. & Meisser, N. (2003): Les minéraux de L'A Neuve. Schweizer Strahler / Le Cristallier Suisse, Nr. 3, 28-37.; Cuchet, S., Schnyder, C. & Meisser, N. (2003): Les minéraux de L'A Neuve. Schweizer Strahler / Le Cristallier Suisse, Nr. 3, 28-37.
von Knorring, O. and Dearnley, R. (1960) The Lewisian Pegmatites of South Harris, Outer Hebrides. Mineralogical Magazine, vol. 32, n° 248, p. 366-378.; Livingstone, A. and Macpherson, H.G. (1983) Fifth supplementary list of British minerals (Scottish). Mineralogical Magazine, vol. 47, n° 342, p. 99-105. Rocks & Min. (2007) 82:236-237; Brown, TJ, "Geology & Geochemistry of the Kingman Feldspar, Rare Metals and Wagon Bow Pegmatites" (2010). University of New Orleans Theses and Dissertations. Paper 1280. Murdoch, Joseph & Robert W. Webb (1966), Minerals of California, Centennial Volume (1866-1966): California Division Mines & Geology Bulletin 189: 367; Pemberton, H. Earl (1983), Minerals of California; Van Nostrand Reinholt Press: 462. Foord, E. E. (1977), Famous Mineral Localities: the Himalaya Dike System, Mesa Grande District, San Diego County, California. Mineralogical Record 8(6): p. 472.
ⓘ Iron Hill (Iron Hill carbonatite complex) ? Januzzi, Ronald E. (1976): Mineral Localities of Connecticut and Southeastern New York State. The Mineralogical Press, Danbury, Connecticut: 192-201. King & Foord, 1994. Mineralogy of Maine, V. 1. Robert C. Smith II (1978) The Mineralogy of Pennsylvania 1966-1975, p 190.
ⓘ Morefield Mine (Morefield pegmatite) ? Rocks & Min. : 62: 190-193.